It seems crazy now to think that with the introduction of the incredibly successful Honda 4-stroke 750 back in ’68 that their rivals would even consider developing 2-stroke technology. But not only did they consider it, they decided to go ahead and manufacture even bigger, faster versions. Honda had invested heavily and cleverly in what they considered to be the way forward – performance through sophistication. Kawasaki shelved their own 4-stroke 750 in a huff because Honda had beaten them to the Tokyo show, and decided to hedge their bets with performance strokers before returning a few years later with the magnificent Z1. So at a time when the American market had shuddered with the horror of its first fuel crisis since the war, Kawasaki proceeded to go against the grain and major on old-school technology and staggeringly high levels of excitement with their now-legendary H2 750. That’s a 750cc two-stroke. Meanwhile Suzuki set out to provide a compromise that would hopefully appeal to potential buyers of both 2 and 4-stroke bikes. The perfect solution, as far as Suzuki was concerned, would be to take smelly 2-stroke technology on to the next level. Water-cooling would show the world that not only is there life in the screamers, but a future through reduced noise and emissions with the increase in reliability to boot. 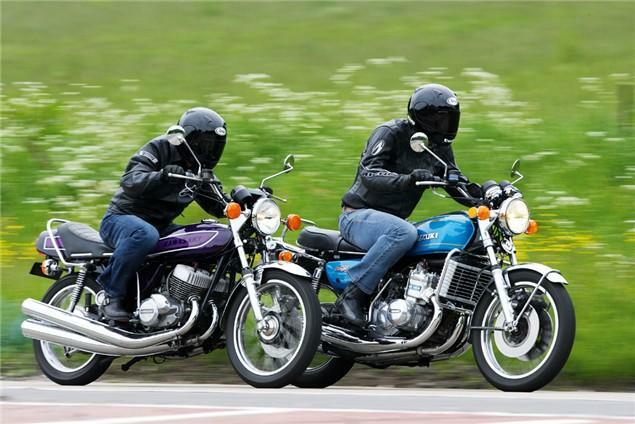 The GT750 was born and whilst the press didn’t exactly rave about its performance, they were impressed with the technological advances and its future potential. The GT was a big old girl with the girth of a touring machine, and thanks to all the extra plumbing, she was destined to impress rather than thrill. The result was two incredibly different machines. In the blue corner a technological showpiece for the more mature, eco-friendly customer, the Suzuki ‘Kettle’. In the purple corner is the Widow Maker, a noisy and terrifying relic for the less mature, psychopathic customer. And so to today. In front of me are two stunning examples of motorcycles that adorned my bedroom wall for at least one year each, and they still create a rush of blood to the heart. The Kawasaki is as tiny as it is pretty - belying its savage nature, while the Suzuki is low and fat – perhaps declaring a sedate experience ahead. I absolutely have to start with the H2 because it’s hilarious. It is so pure and basic in the flesh that it’s impossible to imagine what else the designers could have left off it. With the exception of the steering damper mounted on the left side (presumably to adjust frantically, as you head over a cliff), there is little concession to practicality. Glancing from one to the other, it’s hard to imagine the GT putting up any kind of a fight at all, laden with luxuries such as a front mounted radiator, electric fan and electric push button start. We’ll discuss the merits of its second front brake disc shortly, but not before mention of its futuristic digital gear indicator. Hold the Kwacker’s spring-loaded choke lever open, flip up the right-hand foot peg, twist out the kick-start, give it one good firm prod and hey presto, we’re in the 1970s! Put the foot peg and kick-start back into position (how many starts before this gets bloody tedious? ), release the choke after a few seconds and bask in your very own toxic, smoky atmosphere. The engine is loud but extremely crisp after its recent rebuild and sends a deep crackle from the three exhaust pipes. Press down on the gear lever and the neutral light stays on but press up and you engage first gear – how queer! I had completely forgotten that all five gears are above the neutral position, and quite how daft that configuration is. If ever a bike needed a gear indicator, ironically, this is it. Not pulling away at the lights and making an arse of yourself whilst attempting to perform a U-turn are all part of the Kawasaki Widow Maker experience. I’m shaking my head and laughing before I’ve left the car park. The gearbox is all wrong, the starting procedure is too fiddly and best of all, a high-performance sports motorcycle with no engine braking has been equipped with one less front disc than necessary. Yes in their wisdom, the marketing boys decided to offer the second disc as an optional extra. Thank God it’s dry today and this little devil has been fitted with modern compound rubber. Easing it out of the gravel car park and straight onto a sweeping A-road, the seemingly weightless KH is nimble and crisp through the gears. It accelerates cleanly up to 4,000rpm before the vibration makes itself known. I throttle off instantly as it’s so severe, it feels as though I should whip the clutch in, and then the next dose of reality bites. The H2 can’t run cleanly on an open throttle (and isn’t supposed to). It surges so badly that it seems like it’s running out of fuel and seizing up, because Kawasaki couldn’t find a way of getting the mixture through such large ports – a common problem on giant strokers. So, it’s back to the vibration that kicks in at the same time as the power at 4,000rpm. Despite rubber-mounted handlebars, it’s quite intense – as are the vibes through the foot pegs - and the mirrors stay blurred throughout. Just as I’m beginning to wish that I’d had a different poster on my bedroom wall for that particular year, the core of this bike – its performance – introduces itself with such a huge slap in the face, that I can’t decide whether to become speechless or gibber like a baboon. It’s all the more shocking for unleashing itself in top gear as I’m trying to get my head round the vibration/surging issues. Accelerating from 50mph to see if the vibration would diminish as the revs climb, the thing starts taking off at 4,000rpm and just pulls all the way, like crazy, to just shy of the 7,000rpm redline. It’s just so bloody fast that I’ve been caught out by a 30 year old 2-stroke and it’s fantastic! The speedo needle is flapping around like a landed salmon but we’re well into 3-figure territory as a series of bends approach. I haul on the front brake lever and nothing happens. I stamp on the rear pedal and that has much more effect as the front end shimmies and settles into the first turn. This is way faster than I had expected so I repeat the process in the other direction. Same story. I hang on for dear life as my head starts coming off, then I panic as the thing won’t slow down and then I laugh as I successfully coax it through the next series of corners. These aren’t the words of a starry-eyed old codger. This beast is very quick indeed and I can’t begin to imagine what it was like to ride the earlier models back in the early ‘70’s that had shorter swing-arms, even less brakes and old-school tyre technology. Screw that. I can see where the ‘Widow Maker’ moniker came from. Even this more civilised model could get you into serious trouble. All this excitement from a top gear roll-on is absurd and it’s even worse through the gears. Crack open the throttle in first gear at 4,000rpm and the front wheel is in the air. It’s incredibly sweet between 4,500-6,000rpm through the ‘box and all negative thoughts about surging are forgotten as it flies between corners. The handling isn’t quite as bad as I’d expected and it’s possible to ride corners fast and smooth with a little preparation and determination. The braking is however, worse than expected with the rear drum outperforming the front disc, but the grin factor is so unexpectedly high that I can forgive the H2 virtually anything. My heart slows as I swap over to the Suzuki Kettle and absorb its appreciable maturity. This doesn’t look likely to shake my fillings loose or give me a coronary, which is a good thing, but will it send me to sleep? I’m happy to turn on the ignition and prod the little starter button rather than faff about with a kick-start. The motor fires within an instant into a deep, sophisticated burble and is startlingly quiet, at both ends. Revving the engine does nothing to incite vibration and little to increase decibels. What a difference to the ropey primeval H2. Press the gear lever down and first is engaged, as is confirmed by the gear indicator, and pull away without fuss or racket onto the same stretch of highway. Not only does the GT feel like a Bentley in comparison, but also as much 4-stroke as 2-stroke. It is super smooth from the off and shakes off its bulbous and lazy perception once above 20-25mph. There’s no disguising its pretentions as a sophisticated Grand Tourer (as its badge might suggest), rather than drag strip hero, and that’s before opening the throttle. It feels solid and well engineered with a deep, wide seat that will keep you happy between fuel stops. It shares a similar CDI ignition unit to the H2 but you’d be forgiven for assuming the Kwak was fitted with points, such is the difference in the smoothness at idle and in traffic. To enjoy a direct comparison, I cover the same route at the same pace, but marvel in the relaxing ride that it offers. Although it produces less power, it is likely to maintain a more constant and reliable output with the benefits of water-cooling. The middle cylinder on a triple generally runs hotter than the outer two, as they are more efficiently cooled due to the lack of wheel and mudguard breaking up the airflow. As 2-strokes fire twice as often as their hi-tech cousins, they generate more heat and lose more power. Water-cooling offers a solution to several problems. Following in the footsteps of the H2, I open the throttle of the GT in the same gear at the same spot and sit back to see what happens. Well, not very much actually. At 5,000rpm the throttle is jammed open. I look down and it’s reading 80mph. I know it’s gathering speed because the needle tells me but the shocking truth is that the GT doesn’t appear to have a power band. It pulls cleanly and does become noticeably stronger as the revs climb, but it’s no 2-stroke. This is a 4-stroke in disguise – smooth, no flat-spots, quiet, no tingling through the handlebars or foot-pegs, no surging, just a very relaxing ride. Let’s not get carried away though. Continuing the process by assessing the GT through the gears and it’s a different matter. It does disguise its speed through its superior bulk, but from a standstill it will actually be hot on the heels of the Kawasaki. It just does it so smoothly compared to the screaming banshee that you don’t realise how rapid it is. No need to panic as you approach the bends either as everything is under control. Although the braking is merely okay, it is a huge improvement on the H2 which refuses to stop at all. There is some feel and feedback at the lever and despite the extra kilos, the GT will easily out brake the H2. Amusingly, the early Kawasaki advertisements declared that their H2 was “the absolute ultimate in touring motorcycles”. But the Kawasaki would be as hopeless at touring (fuel range) as it would be at commuting (fouled plugs). If ever there was a machine built purely in the pursuit of pleasure, this is it. Suzuki did indeed change the face of 2-stroke technology with their user-friendly, super sensible GT750, though emissions eventually put paid to the giant strokers anyway. The GT wants to cosset you and deliver you safely to your country club while the vicious and unnecessary H2 hates you and wants to frighten you to death. That is precisely why it has a fearsome reputation, and why it will always be King of the two-strokes. What a bloody marvellous machine. DROP IT YOU SLAG. WE’RE THE SWEENEY! 1975 was culture heaven with Regan and Carter screeching around in a Ford Granada after nasty villains in MkII Jags. Drinking, fighting, shouting and shagging with the occasional arrest were the ingredients for the gritty reality TV show, and we were hooked. Cinemas stank of Old Spice and fags as we screamed and farted our way through Jaws. Long-haired youths in flared denims sang along to Bohemian Rhapsody whilst simultaneously marvelling at the new-fangled pop video, and Bob Marley preached reggae to the masses in his first UK tour. Bragging rights go to Yamaha as they take the 500cc crown for the first time on a 2-stroke. Ago battled it out with Read and pipped him to the title. Only two 4-strokes managed to end the season in the top ten as the airwaves crackled with the sound of the oily beasts. Five Brits ended their campaigns in the top ten; Read (2nd), John Williams (5th), Barry Sheene (6th), Alex George (7th), John Newbold (8th). Venezuelan Johnny Cecotto is the youngest world champ at just 19. Huge thanks to Phil and Simon for the kind loan of their immaculate strokers.